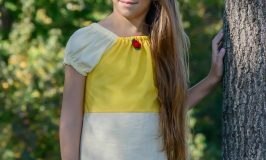 My little girls love it when I get the sewing bug and start making them skirts and dresses for the spring and summer. Trips to Joann’s to pick out fabric and notions is a favorite activity at our house, it really is the simple things. 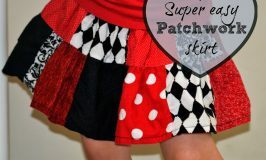 This is one of my favorite skirts to make, it is simple, cute and I can whip one out in about 30 minutes. I can’t ever just make one skirt for one girl, I have to make 3 matching skirts for my 3 little musketeers, so quick and easy is a must! First thing you will need to do is measure your little one’s waist. 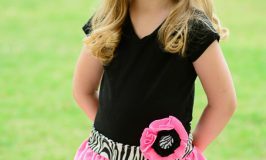 The skirt I used for this tutorial was my 7 year old’s and her waist measured 21 inches. Next measure the length that you want the skirt to be. To get your fabric dimensions take your waist measurement and multiply it by 1.75. that will give you the width in inches. The length is the length that you measured plus 2 inches. You will need to cut a length of fabric for the ruffle that is 3 inches x 1 1/2 times your fabric width. To make the hem fold over the bottom edge 1/4 inch and press. Fold over another 1/4 inch and press. Stitch along the bottom 1/8 inch from edge. of the top of the ruffle piece (the raw non hemmed edge), I usually do 2 rows of stitches in case one breaks. Begin gathering by pulling the top 2 threads and moving the fabric back so it gathers together. Take the skirt piece and lay it on a flat surface and compare it to the ruffle piece to see how wide it needs to be. 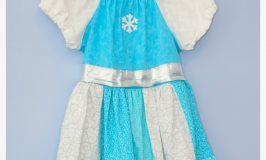 When it looks like it is the right width, pin the skirt to the ruffle at the gather making sure the right sides are together. At this point you will know if it is gathered too much or too little and you can adjust accordingly. When you have finished pinning the 2 pieces, sew them together. Last step is to thread the elastic. 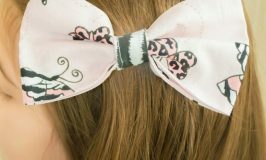 Measure elastic by wrapping it around your child’s waist, it should be snug but not tight. I use an elastic threader with all my elastic. This simple piece of plastic saves me so much trouble! Last sew your skirt together. Put the fabric raw edge to raw edge, right sides together. Stitch closed. Trim excess with pinking shears. I usually also put a label over the place where I sewed the elastic together to make it look cleaner. Such an adorable skirt and pretty simple to make! So cute! And the best part is that it's one of a kind. Thank you for linking at the In and Out of the Kitchen Link Party. Hope to see you again next week. What a cute skirt. 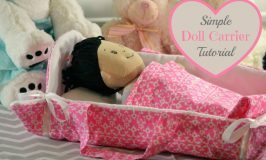 I think I might make a couple for my grand daughter. Thanks for sharing, Bev Beverly recently posted...Dachshund Love!